The Classic Hi Vis Polo Shirts complies with Standard AS/NZS 4399:1996 for UPF Excellence Protection (UPF 40-50). They also comply with the Standard AS/NZS 1906.4:2010 and AS/NZS 4602.1:2011 Class D, day time use only. 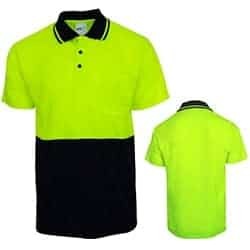 The Classic Hi Vis Polo Shirts are produced from 170gsm 100% polyester for its durability and anti wrinkle properties. The material also features moisture wicking and quick drying fabric. The colours which are available are Black / Fluro Lime and Navy / Fluro Lime. They are designed as daytime work shirt use when being seen is a must in the day. The Classic Hi Vis Polo Shirts are popular with trade workers such as bricklayers, builders and plumbers. 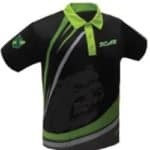 If the Classic Hi Vis Polo Shirts are specially designed to make a person more visible so what better product to display a Company’s logo, brand or message. Therefore this item would serve two purposes. One being making employees more visible when working and the other for promoting a Company’s brand. Branding choices includes Full Colour Digital Printing, Dye Sublimation, Screen Printing and Embroidery but are priced for a full colour digital print on the garment’s front or back. Full Colour Digital Printing, Dye Sublimation, Screen Printing and Embroidery. A full colour digital print on the front or back of the vest. Contact us if other print methods are required.